Have you been keeping up with us on facebook and twitter? If not, you may have been missing out on some very exciting news! Gnosis is counting down to December 6th and our biggest event of the year- the “Dance for Another Day” Charity Dance Showcase Benefiting the Alliance for Lupus Research. Starring Gnosis Dance Collective alongside dozens of other talented and diverse performers from around the Bay, DFAD 2014 is sure to be a night to remember! 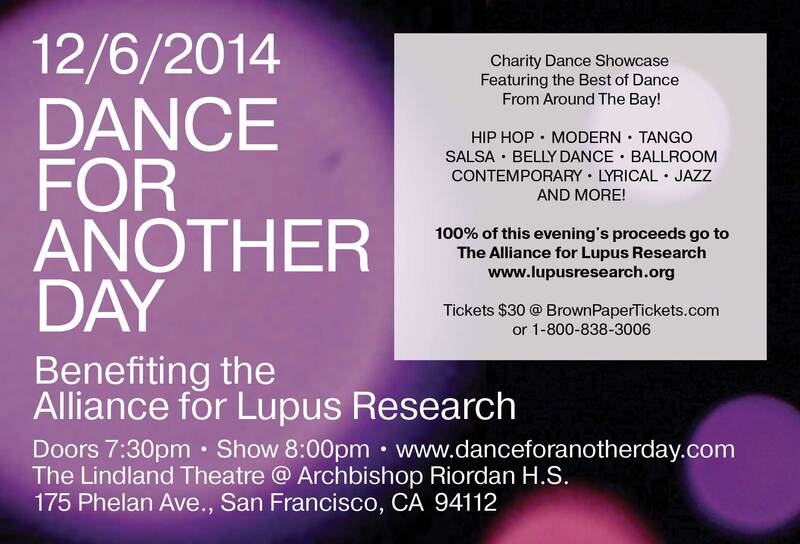 Featuring hip hop, modern, ballroom, salsa, tango, contemporary, jazz, dance theater and more, DFAD is one of the most unique and uplifting events of its kind and 100% OF ALL PROCEEDS FROM THIS EVENT WILL GO TO THE ALLIANCE FOR LUPUS RESEARCH. So get your tickets today at BrownPaperTickets.com and prepare to be wow’ed! Can’t make it to the show? You can still make a difference. Please help us spread the word about this fantastic event and very worthwhile cause- download the flyer above and post, tweet, email, etc. Help us spread the word! And it’s easy to make a modest tax-deductible donation online at PayPal.com. Just $1 adds your strength to ours in the fight against lupus. Together we can make a difference…together we will find a cure! This entry was posted on Monday, November 24th, 2014 at 6:12 pm and is filed under Uncategorized. You can feed this entry. You can leave a response, or trackback from your own site.